Hancock Stadium is home to Illinois State’s Redbird Football team. For nearly four decades, Hancock Stadium has maintained its old-fashioned football tradition of keeping the fans on top of the game while moving forward with continuing enhancements for those who play, coach, or watch Redbird football. Since 2000, the 15,000-seat facility has featured the Kaufman Football Building at its northeast corner—the spacious, versatile, well-equipped home for Redbird football players, coaches, and staff. The fans are still close to the action, but improvements like artificial turf, the finest in scoreboards, and a state-of-the-art sound system provide the kind of atmosphere that makes playing and watching in Hancock Stadium a memorable experience. 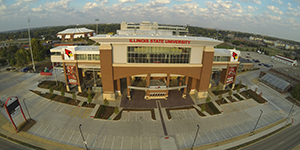 Illinois’ first college football facility with artificial turf (1969), Hancock Stadium is named for former Illinois State athletics director Dr. Howard Hancock, Redbird football coach from 1931-44, athletics director from 1931-63, and a revered pioneer in college athletics. From their inception in the 1970s until the late 1990s, Hancock Stadium also played host to the Illinois High School Association’s championship football games. The first football game at Hancock was played Sept. 28, 1963, as Illinois State played host to Indiana State.